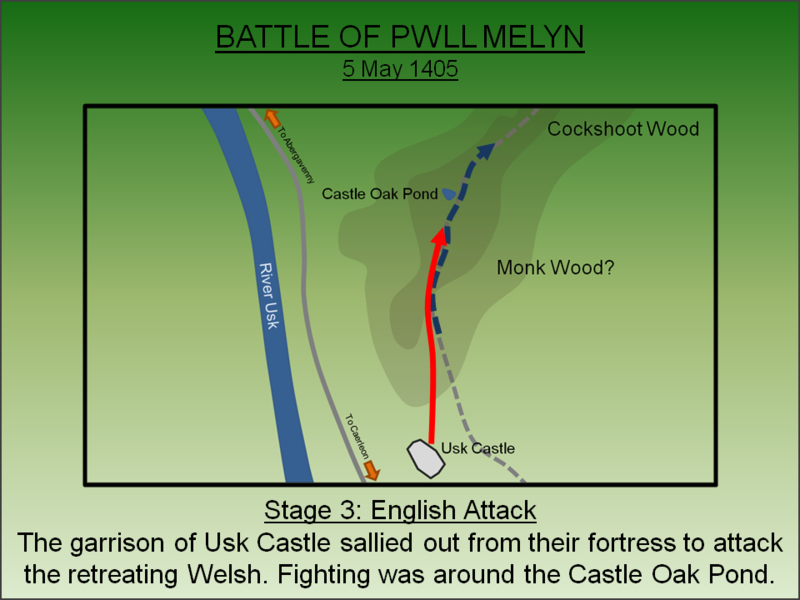 After suffering a defeat at Grosmont, the army of Owain Glyndŵr attempted to restore their reputation with an assault on the English forces at Usk Castle. They were repulsed and, as they retreated, the garrison sallied out where they routed the Welsh at the Battle of Pwll Melyn (1405). After over 200 years of piecemeal advances and setbacks, the Norman conquest of Wales was finally completed in 1283 by Edward I. He cemented control of the Principality with a myriad of new and upgraded castles. From these he imposed an English style administrative system on Wales but, after over a century of brutal and unjust English officialdom, many of the native Welsh came to bitterly resent their overlords. Added to these existing tensions was the overthrow of Richard II in 1399. Amongst the English aristocracy, Richard's reign was seen as tyrannical and a failure. When the exiled Henry Bolingbroke invaded, Richard's regime crumbled and he was forced to abdicate. Bolingbroke took the throne as Henry IV and appointed his son, Henry of Monmouth (later Henry V), as Prince of Wales. Such regime change was not welcomed in Wales and resentment grew. The spark that ignited this simmering discontentment came from a relatively unlikely source - a local landowner named Owain Glyndŵr. Although descended from the Princes of Gwynedd, he was in his early forties by 1400 and, as Lord of Glyndyfrdwy, had vested interests to protect. He was also a London trained lawyer and was married to an English wife. Despite all this, in 1400 a dispute with Reginald Grey, Baron Grey de Ruthyn over a parcel of land at Croesau (now called Bryn Eglwys), paved the way to rebellion. Grey seized control of the land and, when Glyndŵr petitioned the English Parliament for their support, his plea was ignored. Moreover Grey sought to aggravate the situation by undermining Glyndŵr firstly by failing to deliver a Royal summons and then letting it be known that he intended to "burn and slay" the Welshman's territory. When Glyndŵr wrote back promising to reciprocate, Grey had him denounced as a traitor. Glyndŵr was outraged and on the 16 September 1400 proclaimed himself as Prince of Wales. Welshmen flocked to Glyndŵr's cause and on the 18 September 1400 Ruthin town (but not the castle) was burnt. A trail of destruction followed as Denbigh, Rhuddlan, Flint, Hawarden, Holt, Oswestry and then Welshpool were sacked. Henry IV tried to bring him to battle but Glyndŵr evaded a pitched engagement and instead led a guerrilla war against the English. He successfully ambushed the Royal army at Hyddgen in Summer 1401 and in Cardiganshire later the same year. Further victories followed at the Battle of Fyrnwy (1402) - where Lord Grey was captured and subsequently ransomed - and at the Battle of Bryn Glas (1402). With the situation in Wales in meltdown, Henry IV again led another Royal army into Wales adopting a three pronged advance as Edward I had done a little over 120 years before. Once more Glyndŵr evaded contact and ultimately torrential rain brought the English campaign to a halt. 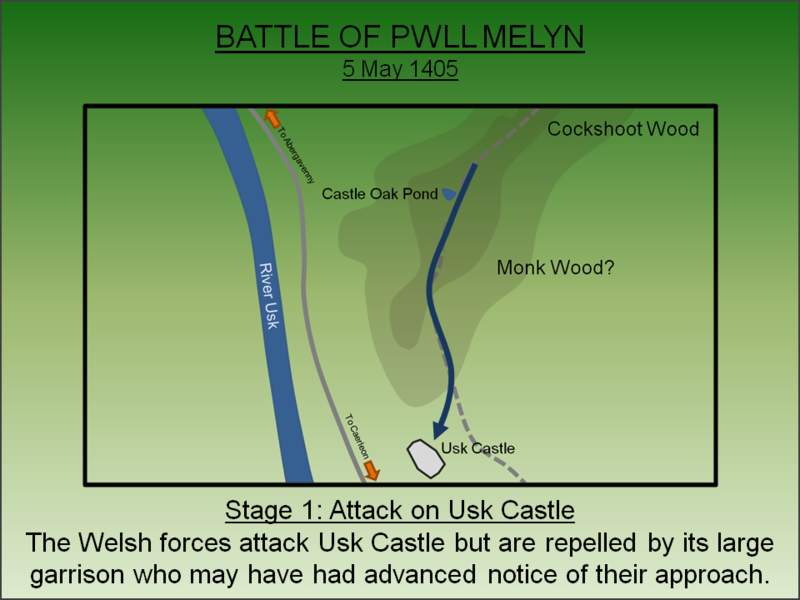 Such was the course of the rebellion for the next few years as the Welsh launched regular attacks, including an assault on Usk in 1403, before melting back into the mountains. Glyndŵr's support was weakest in South-East Wales and so in March 1405 he dispatched an 8,000 strong Welsh force under Rhys Gethin to attack Grosmont Castle. 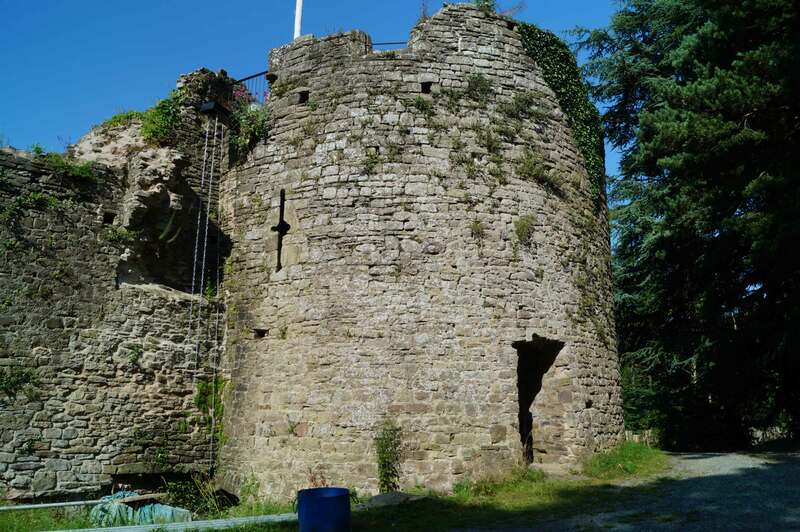 Details of the engagement are sketchy but it seems the Welsh besieged the castle but were then intercepted by a relief force, under Lord Talbot, that had been dispatched from Hereford Castle. Prince Henry wrote to his father informing him of "great slaughter" inflicted upon the Welsh. Whilst this cannot be verified, it seems likely they did suffer a significant defeat which included the death of Rhys Gethin - the seasoned commander who had engineered the significant victory at Bryn Glas in 1402. 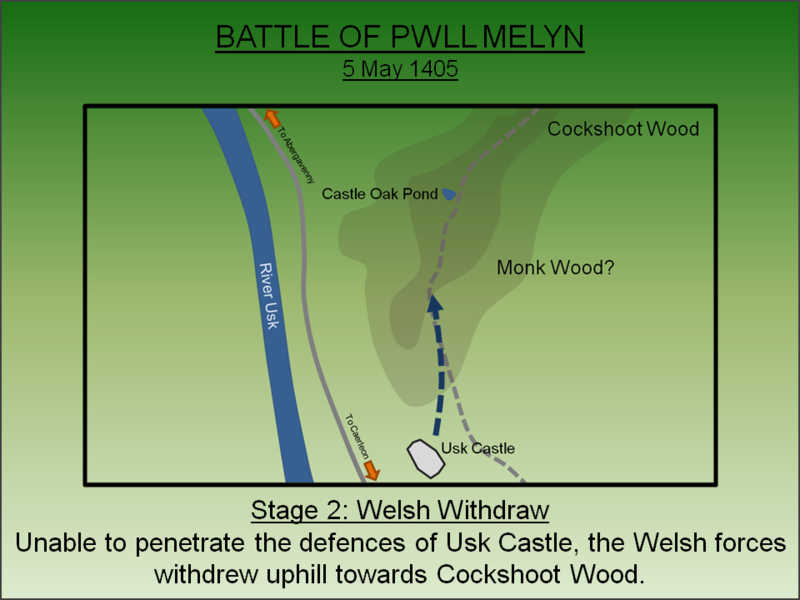 In light of this reversal the Welsh looked for an opportunity to revive their cause in South-East Wales and accordingly deployed to attack Usk Castle. The English force was under the command of Lord Richard Grey of Codnor. He was well supported with Dafydd Gam, an experienced loyalist Welshman with extensive local knowledge and support, plus two Knights - Sir John Greyndour and Sir John Oldcastle - along with their retinues. It is possible the English also knew the attack was coming. Dafydd Gam, who would later go on to fight and die at the Battle of Agincourt (1415), was a prestigious local landowner and may have had an intelligence network that informed the English preparations. This is particularly likely given Glyndŵr made a devastating attack on Usk in 1403 which doubtless turned a few of the locals against the rebellion. 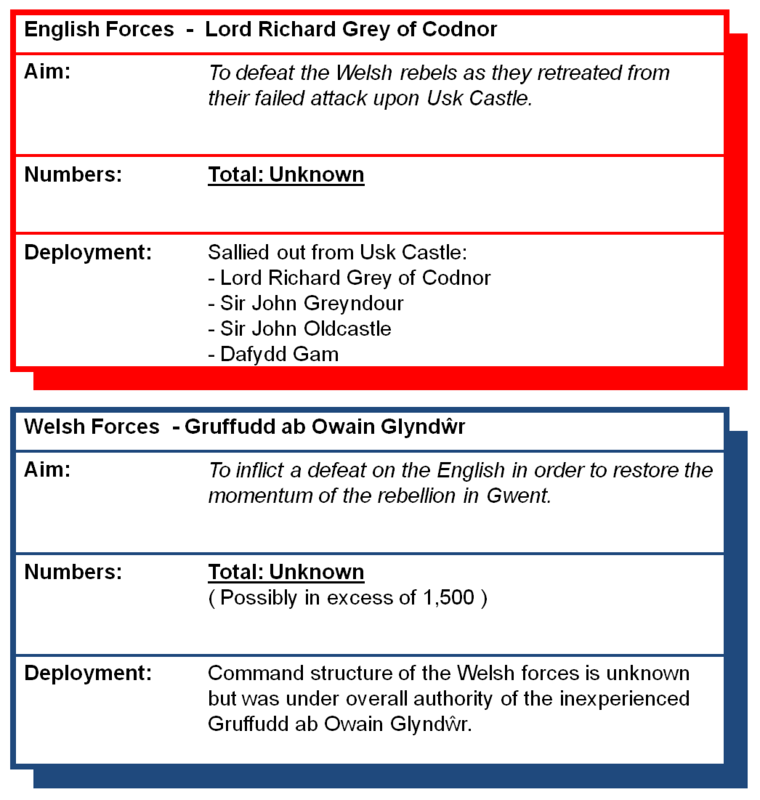 The Welsh force was commanded by Glyndŵr's own son, Gruffudd. The precise size of the Welsh contingent is unknown but it can be assumed to be significant by the presence of so many magnates within it including Glyndŵr's brother, Tudur, and brother-in-law, John Hanmer. Also present was John ap Hywel, Abbot of Llantamam who was a strong supporter of the Welsh cause. The battle was probably fought on 5 May 1405 although some sources suggest it may have taken place in March of that year. The terrain has changed significantly since the battle as it has been extensively drained. Pwll Melyn means 'Yellow Pool', a reference to the water feature that still exists, albeit in reduced form, as the Castle Oak Pond. The Welsh troops attacked the northern side of Usk Castle hoping to breach the defences. The castle however withstood the attack perhaps due to the presence of an unusually large garrison paired with experienced commanders. The Welsh withdrew north towards Monk Wood (now farmland). Their intent at this time is unclear. The garrison of Usk Castle, led by Lord Richard Grey of Codnor, sallied out of their fortress in pursuit. They fell upon the Welsh in the vicinity of (the modern) Castle Farm where they routed them. Castle Oak Pond, the 'Pwll' that gives the battle its name, was clearly on the line of retreat as numerous human skeletons have been recovered from it. Welsh casualties were heavy with one source suggesting 1,500 were killed including Glyndŵr's brother, Tudur. A large number of Welsh troops were also captured including Glyndŵr's son, Gruffudd. Whilst he would be taken as prisoner to the Tower of London, where he would he held for six years until his death in 1411, the rank and file were less fortunate. 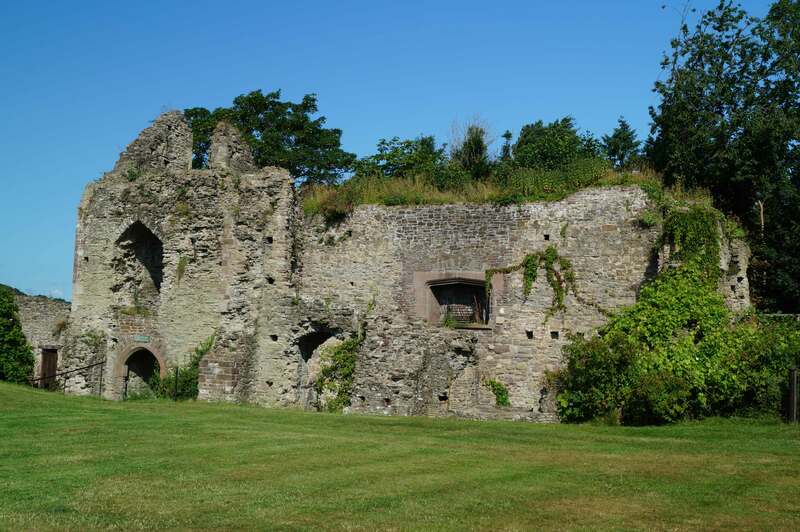 A contemporary chronicler noted that 300 prisoners were beheaded outside the walls of Usk Castle. The Battle of Pwll Melyn marked the end of the Glyndŵr rebellion in South-East Wales whilst the brutality of the post-battle executions also showed the English determination to suppress the rebellion by any means. Nevertheless the revolt continued and by 1406 Glyndŵr was more or less in control of most of the rest of Wales. It would take Royal forces four years of hard campaigning before the English finally gained the upper hand. The fall of Harlech Castle in 1409 - which saw the capture of Glyndŵr's wife, daughter and grand-children - marked the effective end of the rebellion. Despite being offered a free pardon in 1412, Glyndŵr himself refused to surrender and was never caught. Griffiths, R.A, Hopkins, T and Howell, R (2008). The Gwent County History. University of Wales Press, Cardiff: University of Wales Press. Knight, J.K and Johnson, A (2008). Usk Castle, Priory and Town. Logaston Press, Almeley. Lancaster, J.H.D (2014). Pwll Melyn: Battlefield visit notes and observations. CastlesFortsBattles.co.uk. Newman, J (2000). The Buildings of Wales: Gwent/Monmouthshire. Yale University Press. Ordnance Survey (2016). Monmouthshire. Scale 1:1250. Southampton. Phillips, N (2006). Earthwork Castles of Gwent and Ergyng AD 1050-1250. British Archaeological Reports, London. Russel, J and Cohn, R (2012). 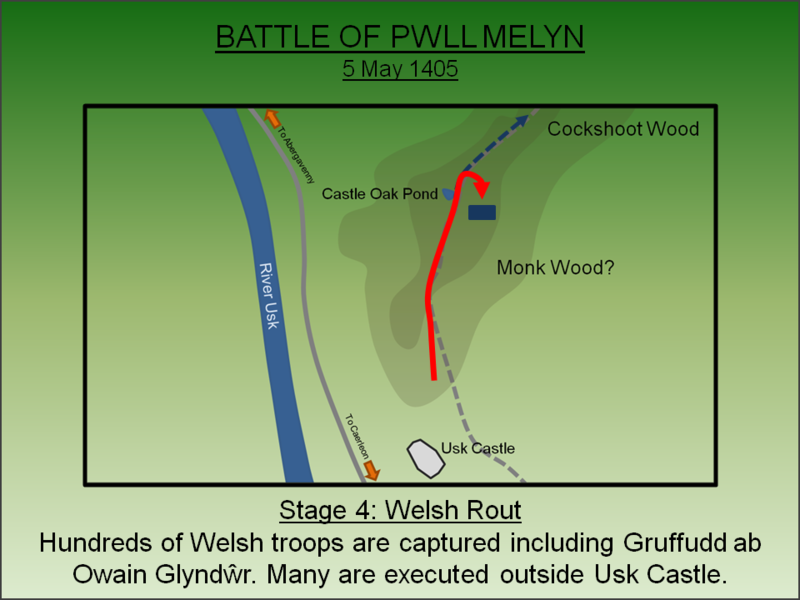 Battle of Pwll Melyn. Bookvika Publishing. Spurgeon, C.J (1987). Mottes and Castle Ringworks in Wales. London. The landscape has changed beyond recognition from the time of the battle. 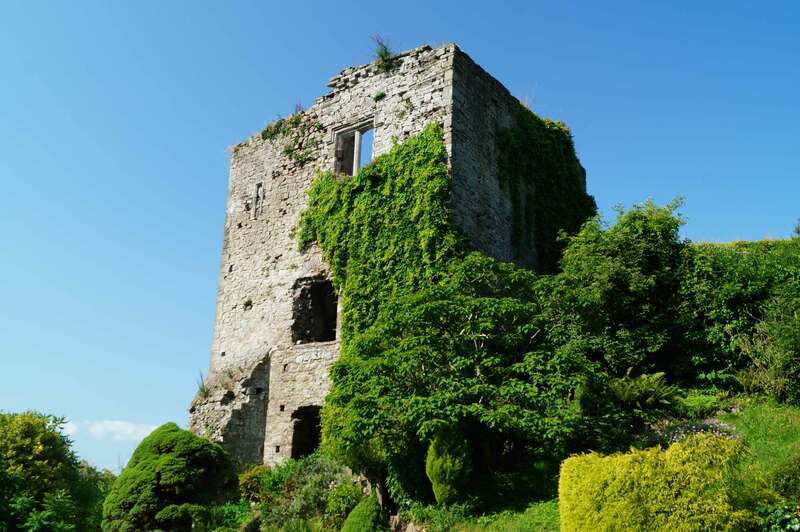 Usk Castle would once have dominated the surroundings but is now ruined and its dominant position made less obvious by trees. The road towards Castle Oak Pond probably follows the line of the medieval track but, whereas this would once have been bog and woodland, it is now drained farmland. Nevertheless a visit to the site is still rewarding and can be paired with a visit to Usk Castle (ruins are open at any reasonable time). A public right of way follows the road and leads to a small plaque near Castle Oak Pond. Pwll Melyn Battlefield. Today the battlefield offers a pleasant walk along a country lane but the character of the landscape was very different in 1405. 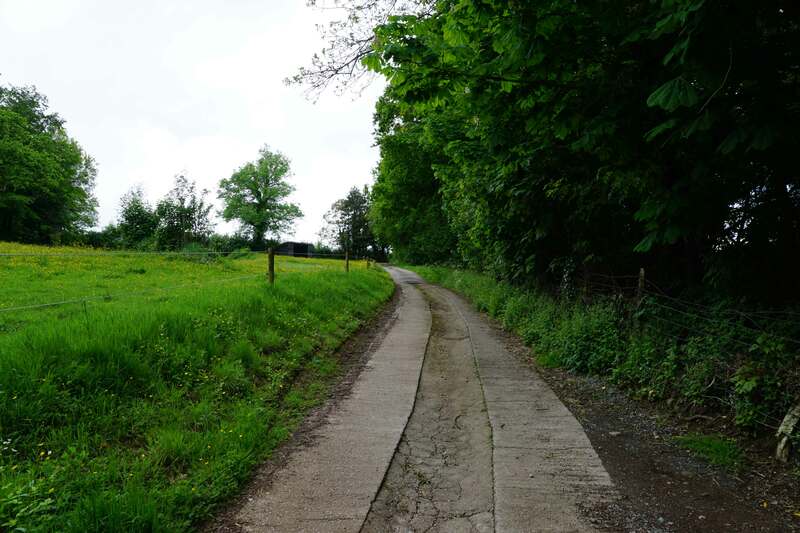 The line of the road probably follows an earlier medieval track but either side would have been woodland or bog. This would have prevented the Welsh responding to the English attack to their rear. Plaque. A plaque was put in place in 2007 near Castle Oak Pond. To find it continue beyond Castle Farm and look to your left (the plaque is just off the track). Public Footpath. The battlefield is sign-posted but the route is quite clear! Usk Castle. The castle is now ruinous and has been incorporated into part of a private garden. Nevertheless the ruins are accessible at any reasonable time. 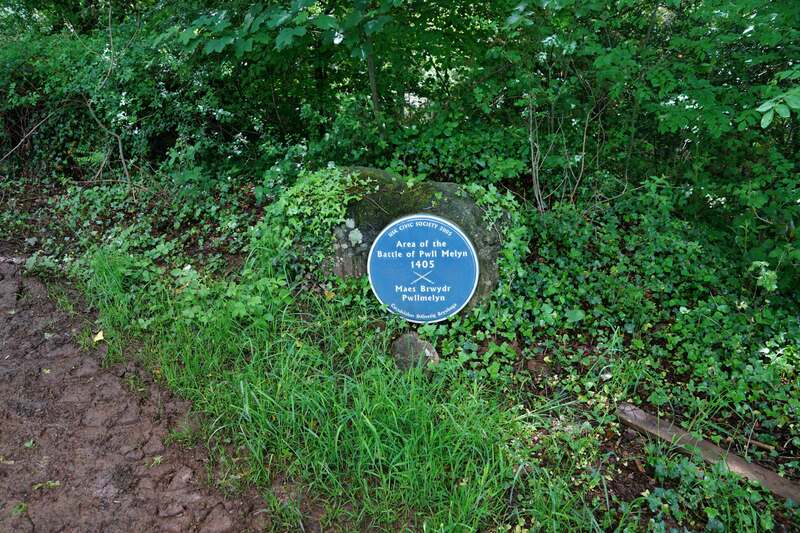 Pwll Melyn battlefield and Usk Castle are found directly off the A472 Monmouth Road. 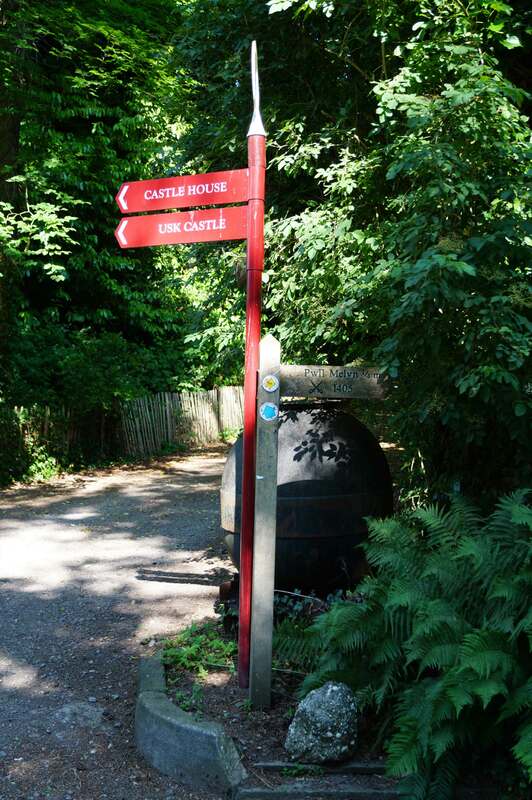 There is a dedicated car park for visitors directly adjacent to the castle and the public right of way towards the battlefield. Both are clearly sign-posted.